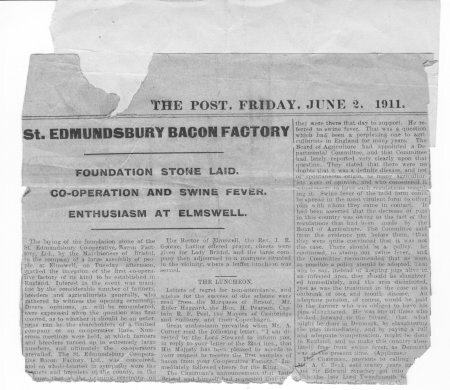 The laying of the foundation stone of the St. Edmundsbury Co-operative Bacon Factory, Ltd., by the Marchioness of Bristol, in the company of a large assembly of people at Elmswell, on Tuesday afternoon, marked the inception of the first cooperative factory of its kind to be established in England. Interest in the event was manifest by the considerable number of farmers, breeders and agriculturists generally, who gathered to witness the opening ceremony. Divers opinions, it will be remembered, were expressed when the question was first mooted, as to whether it should be an enterprise run by the shareholders of a limited company or on co-operative lines. Numerous meetings were held, at which farmers and breeders turned up in extremely large numbers, and ultimately the co-operators prevailed. 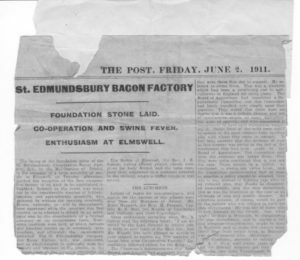 The St. Edmundsbry Cooperative Bacon Factory, Ltd., was conceived, and whole-hearted in sympathy were the farmers and breeders of the county, in the scheme that at the opening ceremony on ………………………………………. reported. The Vice-Presidents include the Lord-Lieutenant of the County, Sir Courtenay Warner, C. B., M.P., and Mr. A. S. Wakelin is secretary of the energetic Committee, which comprises practical men of the county. Five and a half acres, situate quite close to the Great Eastern Railway line at Elmswell, is the site of the factory to be erected. It is understood that the Great Eastern Railway Company intend to construct a siding from the line into the yard of the factory. A moderately broad road has been laid down leading from the road which runs through the village. Building operations will be commenced immediately, and it is hoped to have the factory open during October. Unusual, yet decidedly popular, was the step taken by the Committee in consulting a Danish architect. The result is that Mr. Wendelbo Madsin, of Copenhagen, has designed for the Company a factory modelled on the latest style of the co-operative factories in Denmark, where the system of co-operation and combination has proved so great a success. The building, which will be built entirely of brick, with a boarded roof, covered in water-proof felt, will be 223 feet long and 75 feet broad. The walls of many of the rooms – the curing room, the chill room, the stores, the offal room, the salting cistern, and similar places – will be covered with cork insulating between the bricks and the plaster, for the purpose of ensuring greater coolness. The walls outside will be white- washed. There is a sausage factory forming part. of the building, and there will be a lard room, where lard is boiled, and a lard store. There is also a salting cistern for the heads. In the engine room, in addition, to working the ordinary machinery, power will provide electric light for lighting the whole of the building, and will also work the refrigerating plant. The Committee propose to carry out the work themselves, subject to contracts for the machinery, etc. and Mr N. Kirkebjerg will superintend the construction on behalf of the architect. The whole undertaking is estimated to cost about £10,000, reckoning land, buildings, machinery, light, etc. When in full work, about 750 pigs can be dealt with every week. The pigs first enter the weighing room where their live weight is ascertained, and then they take their places in the styes prepared for them, to stay there until they are wanted. They are to be killed, scalded, scraped, and cleaned in a most scientific manner, with the minimum of labour and delay. They will then go to the cutting and weighing room, where the dead weight is ascertained. From there they will be sent to the hanging room, where they should be kept about 24 hours. Here they are chilled and despatched to the cooling cellar for a time, whence they go to the baling room or the smoke stove, according to their ultimate purpose. When in full working order, it is anticipated that the factory will be able to deal with about 750 pigs a week. In front of a small portion of wall which had been built a temporary platform had been erected. From this unassuming and undignified rostrum the formal ceremony of the stone-laying was performed. On the platform, in addition to the Marchioness of Bristol – who had driven up in a low carriage drawn by a pretty pair of Shetland ponies – were the Lord-Lieutenant, Sir Courtenay Warner, M.P., and Miss Warner, Sir Edward Strachey, M.P., Parliamentary Secretary to the Board of Agriculture, Sir James Malcolm, Mr. C. Beck, M.P., Mr. Frank Goldsmith, M.P., Mr and Mrs A. Corner (from London), the Mayor of Bury St Edmunds, (Mr. J. Ridley Hooper), the Rev. A. G. Lee, the Rev. J. Wilson Brown, Rev. K. Hewitt, the Rev. J. R. George (Rector of Elmswell), Mr. G. C. Capon and Mr. J.B. Chevallier, vice-presidents, and the following members of the Committee of Management: Messrs. T. E. Robinson (chairman). J. B. Chevallier, W. Breese, C. Bridges, W. Cross, R. Hitchcock, G. Horrex, jun., W. Morley, W. Symonds, A. S. Thurlow and A. S. Wakelin; Mr. Duncan Parker, Mr. J. Burstall, Mr. J. C. Leatherdale, Mr. W. E. Riley, Mr. J. E. Patterson, Mr. Willoughby Wright, Mr. John Gage, Mr. P. Breese, Mr. Felix Gage, Mr. J. J. Wenham, Mr. J. A. Badham, Mr. W. J. Ruffle, Mr. T. Brame, Mr. Harry Cross, Mr. Arthur Symonds, and others. Mr. P. Riley Smith, who is one of the vice-presidents, was prevented from attending on account of the death of his brother. They were gathered together that afternoon to say that they meant business, and were going to do something in the way of pushing forward their agricultural interests in West Suffolk and East Suffolk too. He thought that a most auspicious inauguration of that most necessary principle for farmers – co-operation – which they hoped would lead to much greater prosperity in all agricultural interests. They also hoped that that effort, that they were beginning that day would be the foundation stone, not only of the bacon factory, but also of the future prosperity of agriculture in that part of the country. (Applause). The Lord Lieutenant asked Lady Bristol to come forward and do the important part of the day’s work, that was to lay that stone on which they were going to build so much. The Most Hon. The Marchioness of Bristol, formally, with a silver, trowel, then laid the stone of the building, which, in future, will be known as the St. Co-operative Bacon Factory, Ltd.
“This stone was laid by the Most Hon. the Marchioness of Bristol in the Coronation year of King George V., May 30th, 1911. The Rector of Elmswell, the Rev. J. R. George, having offered prayer, cheers were given for Lady Bristol, and the large company then adjourned to a marquee situated in the vicinity, where a buffet luncheon was served. Letters of regret for non-attendance, and wishes for the success of the scheme, were read from the Marquess of Bristol, Mr. Rider Haggard, the Hon. H. Pearson, Captain R. E. Peel, the Mayors of Cambridge and Sudbury, and from Copenhagen. Great enthusiasm prevailed when Mr. A. Corner read the following letter: “I am directed by the Lord Steward to inform you, in reply to your letter of the 22nd inst., that His Majesty has been pleased to accede to your request to receive the first samples of bacon from your Co-operative Factory.” Immediately followed cheers for the King. The Chairman’s announcement that Lady Bristol and himself had requested that they ………………………………. bacon was the occasion of more cheering. He believed if all farmers joined together, if all worked side by side with one another, they would not only get the benefit of good fel- lowship, but the solid benefit of profit. (Applause). He wished the scheme every success, and anything he could do for the success of such co-operation as that, and any future co-operative movements that might take place, he would always be ready to do. He could not take the responsibility of any of those cooperative movements, he could not be chairman of the company or association, because he did not think anybody ought to vouch for any business that he did not manage himself. Sir Edward Strachey, Parliamentary Secretary to the Board of Agriculture, said he had come there that day to show that the Board of Agriculture was entirely in sympathy with the movement, in fact any movements of that sort. He had also another interest in coming down to Suffolk. Their Chairman knew perfectly well that he had a personal interest in that great industry which they were trying to promote further that day. Although he did not pretend that the county from which he came, Somerset, was as great a breeding county as Suffolk, yet it was a near runner-up. He could speak from personal experience of the trials of pig breeders, not only in the matter of bad prices, but also of the practise known as docking, a practise very common in his part of the country. A co-operative system such as theirs ought to have the effect of stopping that sort of thing, and it also ought to have the effect of educating farmers and co-operators generally to the best way of grading their pigs which they sent, and the best conditions under which they should be fed and bred. At the present moment farmers to a very large extent were isolated, they lived in isolated areas, without co-operation and combination. But there was no doubt that ought to be altered, and could be altered, to enable them to carry on their business in the same way as other businesses were carried on by combination. In the commercial world they invariably found that the big business houses were successful, thee businesses that were amalgamated. That was the kind of thing that they in Elmswell were setting out on. They would amalgamate farmers and agriculturaloists into a big trade society, and they would be able not only to give the ordinary profit to the breeder, but they would get a trade profit as well. (Applause.) In the bad times they would be able to get better prices, and he would remind them that there must be ups and downs in the pig trade, as there always was in any trade, but he had no doubt that organisations of that sort would tend to the decrease of those periods. But again they had got to look forward and look ahead in those matters. Let them look forward, when there was a slump, to the time when there was going to be a rise. He was conscious of it, that if only he had had proper information, he should have made much greater profit out of the boom in the pig trade. He expected other men were in a similar position to himself. With organisations of the sort they would be able to know the prices of the market, and would have the opportunities of finding out what was likely to be the trade of the future, judging, of course, what was the production from abroad and foreign countries. As regards Great Britain, continued Sir Edward, the system of co-operation for selling produce was in its infancy. Let them take Denmark. It was a country which was almost on. the verge of ruin, and there was nothing except the agricultural interest – there was not the great mineral wealth that there was in England. He could only assure them, on behalf of the Board of Agriculture, that they looked forward to the success of co-operation as being a great advantage to agriculture generally, and he could assure them further, that anything they could do to support legitimate co-operation amongst agriculturists, the Board would always be ready to give assistance. (Loud applause.) He thought it had been shown only lately, how anxious the Government was as a whole to assist agricultural interests. The Post- master General stated the other day that he was going to set up a system of agricultural telephoning, whereby farmers for £3 a year, would be able to have telephone service. He thought they could see that day how useful it would be – they would be able to telephone to the factory as regards the proper time to send their pigs in, and in hosts of other ways they would find it useful. It had been found an enormous advantage in other countries, and he had not the slightest fears as regarded this country too, that if they would only combine it would be a very great advantage to agriculturists. He would only say one word more, and that was with regard to a question which was very cognate with the matter which they were there that day to support. He referred to swine fever. That was a question which had been a perplexing one to agriculturists in England for many years. The Board of Agriculture had appointed a Departmental Committee, and that Committee had lately reported very clearly upon that question. They stated that there were no doubts that it was a definite disease, and not of spontaneous origin, as many agriculturalists were of opinion, and who considered it unnecessary to have such regulations regarding it. Swine fever of the mild form could be spread in the most virulent form to other pigs with whom they came in contact. It had been asserted that the decrease of pigs in this country was owing to the fact of the regulations that had been made by the Board of Agriculture. The Committee said from the evidence put before them, that they were quite convinced that it was not the case. There should be a policy, he continued, to stamp out swine fever, and the Committee recommended that as soon as possible a policy should be adopted. The Chairman, previous to calling on MR. A. C. Beck, said maney years ago … and Sir Edward Strachey got into …. with the late Lord Tweedmouth for…. the lobby and advocating that …. measure which they had inaugurated, ……which had been so heartily cheered …way. (Laughter and applause). Mr. A. Cecil Beck, M.P. for the Saffron Walden Division of Essex, said as one who had lived in the country all his life, and as one who took a great interest in agriculture, he believed they were absolutely on the right lines there that day. (Applause.) He thought at present they had 396 members, and he hoped before long they would boast as many as 800. (Applause.) It was their duty as farmers to produce the best produce. He thought they sometimes felt that they did not always get the best of the bargain. There was no better body of farmers in the world than the farmers that hailed from England and Scotland. He knew they grumbled – (laughter) – they all grumbled, and none of them got what they deserved. The farmers were handicapped, he said at present as regarded prices and the state of the market, but under the system of co-operation they were going to get their own people to find those things out for them. He was sure it was a most admirable principle. He would have them remember that they had the whole world in competition with them, but he was quite convinced, that we in this country, could beat the world in competition if they took the trouble (Applause). They had seen the results of co-operation and he believed they that day were doing a splendid work, not only for Suffolk, but also for the whole of English agriculture. Mr. F. Goldsmith. M.P., whose rising was the signal of an outburst of cheering, said he rose that afternoon to move a vote of thanks to their distinguished guests. The very fact that they had come down to Elmswell, showed what a great interest they took in the movement, and that they wished it the greatest possible success. (Applause). He was convinced of the success of the movement by the fact of their having so good a man as his friend Mr. [Robinson?] connected with it. He had worked harder than ever he had seen him work before to make it a success, and he believed he was going to succeed. (Applause.) Their victory was not only going to be a great blessing to the farmers of the district, and a boon to Suffolk, but a boon also to the parish of Elmswell – a boon that was calculated to bring work and money into the parish. (Loud applause.) Before long he hoped they would have another ceremony – the opening of the first co-operative bacon factory in the country. Such schemes had been a success in Denmark, and he, like the other speakers, was convinced that there was absolutely no reason why they should not be a great success in this country. The Mayor of Bury St. Edmund’s (Mr. J. Ridley Hooper) said he felt honoured to be asked to second that vote of thanks. They were there, he remarked, in the course of his speech, to wish the very greatest success to the new company. Co-operation, NO doubt was the right thing in many ways and for a business of that kind it seemed to be the one thing necessary. “WAVING ROPE AT HANGING PARTY” – Bury’s M.P. “I am not one who believes that the trouble in the pig industry is due to the removal of the tariff on bacon. The trouble started long before that. This is simply the last straw.” “The agonising screams from this particular camel are just as distressing as they would be if a ton weight had been thrown on its back. A DANISH boy who came to England in his early twenties, not speaking a word of English, had ambitions in the bacon industry. His first job was in the accounts department of a margarine factory in Cheshire. Then he got his chance as a book-keeper in St. Edmundsbury Co-operative Bacon Factory, Elmswell. “The people here were always very nice to me; they never treated me as a foreigner and I have always felt at home here. I have enjoyed my life and work here and I would never want to live anywhere else”, he said. Before he left the factory, Mr. Andreasen was presented with a television set by the staff. Mr. Andreasen’s successors are Mr. G. W. Cousins, secretary, and Mr. J. Henderson, general manager. In the winter of 1910, a group of Suffolk Farmers held a meeting in Bury St Edmunds; the meeting had been called by Mr T Robinson, a Pjg Farmer from Woolpit, and its purpose was to discuss the poor return being gained for pigs in relation to the high price being charged for ham and bacon products. Great concern was displayed as to the fact that the farmers had only two options when selling their pigs, one to sell directly onto the market and the other to sell to local butchers and, as such, it was deicded that the only possible altern- ative to this problem was to start their own factory and sell their pigs directly to it. Numerous meetings followed and the farmers soon realised that they would require expert knowledge to help this idea materialise. One member was, therefore, sent to Denmark to study the ‘Danes’ very successful methods of pig production and farmer owned factories. After the favourable reports that were received from Denmark, it was decided that the new factory should be set up as a farmer owned co-operative and built and run as closely as possible on the lines of its Danish counterparts. The location chosen for the factory was at Elmswell, a small village in the heart of Suffolk being equidistant from Bury St Edmunds and Stowmarket and within easy reach of all farmers who were planning to become members. The site consisted of five and a half acres of land situated quite close to the Great Eastern Railway line, with the idea being that a siding could be run directly into the factory yard to allow easy transportation of bacon sides to London. To ensure that the factory developed along the required lines Mr J Wendelbo, a Danish Architect, was brought to Elmswell to draw up the plans. All construction work, excepting machinery installation, was undertaken by a committee of farmers under the supervision of Mr N Kirk- ebjerg, another Danish expert. And so it was that the planning and construction of the factory was based entirely on similar types of factories that existed in Denmark at that time. The laying of the foundation stone took place in May 1911, the ceremony being performed by the Marchioness of Bristol; among the many eminent guests were politicians, businessmen, local dignitaries and some 300 members of the co-operative. A luncheon was then held in a large marquee on the grounds and among the many telegrams of congratulations was the following, “I am pleased to inform you, in reply to your letter of the 22nd inst. , that His Majesty has been pleased to accede to your request to receive the first samples of bacon from your Co-operative factory”. And so it was that the first samples of bacon produced at the factory were presented to the King of England. When the building was complete, the plant consisted of a slaughtering area, cutting room, chilling room, lard making room, sausage room and despatch area, the total cost including machinery being £7,000. The first farmer owned co-operative of its kind in England had now been established, and it was hoped that this type of factory would not only ensure a better return for the pig farmer but also help educate the farmers in the best ways of feeding, breeding and grading of their pigs. The whole concept of the factory was to take pigs from its members by arrangement and at competitive market prices, to process and sell the bacon at a profit and to return this profit to its members; firstly as interest on their shares and secondly as trading bonuses related to the value of pigs supplied. In March, 1942, these members totalled 408 supplying about 300 pigs per week to the factory. These pigs arrived by rail, on foot and by horse drawn cart, and after arrival at the factory were killed and cured as whole sides of bacon. The bacon was then despatched via the railway to be sold on the London Provision Exchange, the main bacon trading concern in the country; a few pies, sausages and blocks of lard were also produced and sold through a small shop at the factory. Throughout the 1914-18 War, the factory remained open and indeed flourished; cattle, sheep and calves as well as pigs were slaughtered. In 1919 a profit of £10,007 – 12 – 8d was recorded and this type of profit remained consistent in the early years, proving to the many people who had originally been sceptical of the idea that a farmer-owned co-operative could indeed prove a viable proposition. By 1925, St Edmunds branched out into the pork product market with the idea of providing another outlet for the farmers’ pigs. Three retail shops were also opened in Gt Yarmouth, Lowestoft and Gorleston, where goods under its own “St Edmunds” brand were sold directly to the consumer. In the first year these shops recorded a loss of £1,058 – I – 6d and indeed were only open for three years before being sold due to their unprofitability. – this being against an estimated English production of 80,000 Tons. It was rather ironical that Denmark, the country from which the factory had been styled, now threatened its very existence. From 1927 – 30, the factory made substantial losses and the entire workforce agreed to take a cut in wages at the factory until the early 1930’s when at last profits were again made and no more major problems were encountered until after the second World War. During the war years, the factory again flourished, but even so it was somewhat restricted because all food production was very closely supervised by the Ministry of Food; rationing was introduced and some 30% of all bacon factories were closed, so perhaps this is why the St Edmunds factory was able to progress. In 1949, due to the nationalisation of all transport coupled with heavy increased freight charges, the factory acquired a fleet of road vehicles to carry its products, a garage was built and facilities for maintenance and overhaul were provided, and from this point the reliance on the railways as a method of despatch vanished. Rationing controls ended in 1954 and St Edmunds tried to return to its old pre-war lines, but trading conditions had changed with foreign producers supplying even more bacon to our markets. The Danes again proved the biggest problem with their considerable skill and heavily financed advertising campaigns. The British producers found it very hard to compete, many small bacon producing companies went into liquidation and the staff of St Edmunds realised that a complete overhaul of their marketing methods was required if they were to stay in business. Indeed, a complete change was soon in evidence-, the company diversified, modernised and improved its products, the amount of bacon sold on the London market was reduced and sales were now aimed at the retail and wholesale markets. Sales staff were employed to sell directly from vans thus promoting a direct link with the customers, new products were produced, pies, gammons, sausages and pre-packed bacon were the main lines. All this was very well, but the staff at St Edmunds also realised that to compete with the imports the consistency of product was also a vital factor; the great problem with British Bacon at that time was that one week it could be first class but the very next poor. The only way they knew to overcome this was to ensure the raw material was of a consistent high quality, but no method existed for grading the pigs according to the amount of fat they contained, but St Edmunds introduced a scientific measuring device that was to rectify this. Based on the war-time Asdic principle, an ultrasonic machine called an introscope was introduced which could measure the amount of fat to within 2 mm; this coupled with paying the farmers higher prices for leaner pigs, ensured a high quality product could be consistently produced. Here the fact that St Edmunds was a farmer owned co-operative was very important because they were able to find ideal rearing facilities to produce the required pig. The result of all this work was that grading standards were agreed with leading British Bacon Curers and the County Quality Bacon Federation, and British Bacon was now able to compete in terms of quality with most of the imported bacon. One of the main reasons that the St Edmunds Bacon Factory has been able to survive for so long, is that whenever a problem occurs, it is dealt with swiftly and efficiently and this has definitely applied to its marketing aspect. In 1960, a sub-committee was set up to report on this very aspect of the business; it looked at the current marketing situation and made recommendations for its future. The recommend- ations of the committee, which were later accepted and put into practice, were once again significant in that the idea of selling whole bacon sides was again denounced, with the swing being towards the sale of smaller products. The idea being that products should be progressed as far along the production lines as possible, thus obtaining added value and, consequently, being able to attain higher prices when sold. This added value concept was even more important, in view of the fact that the plant at St Edmunds has always been fitted with up-to-date machinery to increase its throughput of pigs and produce a varied range of products. As a result of these moves, the St Edmunds van fleet was expanded from three to thirteen, and by 1962 a flourishing wholesale trade had been established in London and the Midlands. The Farmers were also made aware of this change, and for the first time since the factory opened they were encouraged and rewarded for producing some of the required pork type pigs. In 1964, St Edmunds commenced trading with Marks & Spencer Limited, as was noted in the Annual Report: “During the year we made arrangements with Marks & Spencer Limited which we hope will be to our mutual advantage”. This relationship has now progressed for fourteen years, and was the beginning of trading with large multiple companies that is so important today. In 1970, St Edmunds faced its biggest crisis in its short history – an outbreak of Salmonella Panama, a form of food poisoning. The factory was closed for two weeks, with pigs being diverted to other plants and considerable disruption being forced upon the customers. Although the factory was generally accepted as amongst the most hygenic in the country, this was, indeed, a testing time. A loss of £40,000 for the year was recorded, against an anticipated profit of £60,000, but such were the ties already created by the company that all its suppliers and customers returned when production was finally resumed. Another example of the company reviewing its marketing policy arrived in the early 1970’s. In 1971 the factory changed its brand name to Farm Kitchen Foods in the hope of progressing more van sales under this new title. In 1972, when large losses were being incurred, an analysis of product margins was the reason for the complete with- drawal from the production of bacon sides; after a period of sixty years, no more Elmswell bacon was to be sold on the London Market. Indeed a loss making situation remained to such an extent that in 1974, due to severe cash flow problems, the company had no alternative but to put itself forward to be taken over by a larger concern, or go into liquidation. The larger concern that was forthcoming, proved to be Eastern Counties Farmers, the major Ipswich based Co-operative which has dealings in almost every aspect of the farming world. Cash was immediately injected into St Edmunds and all shares in the Company were exchanged on an equal value basis for Eastern Counties Farmers shares. This takeover meant that the first farmer-owned co-operative bacon factory was now part of the second largest co-operative in the country but still the farmers retained some say in the running of the business. Indeed, St Edmunds retained its own Board of Directors which, at present, contains five farmer Directory but it was now responsible to the Main Board at Eastern Counties Farmers. During these difficult times, came the inevitable changes in the business itself; at the time, the factory was losing about £10,000 per week and drastic changes had to be made swiftly. Many internal changes were effected, especially to the information systems, but once again the marketing aspect quickly came under the microscope. All products that were earning low profit margins were withdrawn, including the complete range of pies that had, by now, been built into a major line. Sausages were sold frozen as opposed to fresh, thus cutting deliveries from five to one or two per week. All outbased depots were closed, except the London depot, and the van sales fleet was cut from 35 to 10, with a minimum delivery of £10 per customer being included. The whole idea of these changes was to move away from small unprofitable deliveries and to increase trading with the multiple and wholesale customers who took bulk deliveries, which would, obviously, contribute greater profits. The importance of added value was again stressed, and production was now geared around high profit-earning goods such as cooked meats, pre-packed bacon and cured bacon joints and steaks. A result of these changes was a reduction in the company workforce from 500 people to 310, but again the company had reacted quickly and hoped to see improved profits as a result. These profits did not materialise in the first year, indeed in 1975 the company recorded a loss of £150,000, but the benefit was certainly seen in 1976 with a record profit of £301,000 being made. The latest figures for 1977 indicate a profit of about £375,000, so once again the company appears to have made the right decisions at the right time. In April 1976, as a result of these changes, the pig requirement was again revised. A pig somewhat lighter than previously purchased was required and a Syndicate of Producers was set up to ensure the correct quality and, more important, that required numbers could be procured. The raw material supplied to the factory constitutes about 70% of its total costs, and it is, therefore, very important that it can be procured in the exact form required – this has been very obvious in the past and remains equally important today. The main factor when determining the type of pig required, is the products for which it is to be used: in the early years only one type of pig, the baconer, was required. This produced the best and leanest sides of bacon, and the farmers were suitably rewarded for its supply. In later years bacon pigs were still required as was the cutter type pig – a lightweight pig from which pork cuts and pork manufactured products could be produced. Prior to 1970, when about 2,600 pigs per week were being killed, the ratio required was 1800 bacon pigs and 800 cutter pigs, and prices were set to attract a pig of 120 – 160 lbs (deadweight) with additional reward for the 140-160 lbs pig. Any pig purchased below 120 lbs was not suitable for processing and was sold, at a reduced price, as a carcase. Today, the factory kills 2,600 – 2,800 pigs per week, with the emphasis being towards a pig slightly heavier than the average bacon pig, about 75 kgs as opposed to 68 kgs. Approximately 90% of these are purchased on contract, with the odd 10% being bought on the open market (flat rate pigs). Contracts are set up with the producers on an annual basis, being made up of six periods; each producer contracts a certain number of pigs each period and is allowed a 10% tolerance on this number. This method allows a consistent flow of pigs throughout the year and also allows the producer some lee-way on his contracted number. Prices are worked out on a fixed formula on a weekly basis, bearing in mind price trends, competition, requirements and the current profitability of the company,with the overall aim being that of giving the farmer the best possible return, whilst also allowing the company to remain profitable. Contract pigs fall into two categories, high weight being72½ – 80 kgs and low weight being 64 – 72 kgs, with approximately 75% of the weekly kill being high weight and 25% being low weight; pigs falling outside these weight ranges are penalised and the price paid is reduced. Within each range the price paid depends on the amount of fat contained on the animal. The fat thickness is measured at a point on the pigs back by Government approved Inspectors, and can vary from under 10mm to over 30mm with the highest being paid for under 18mm, and the lowest for over 26 mm. This grading and payment method is, obviously, a way of rewarding the producer who sends the highest quality pigs, and is both beneficial to the factory and the producer alike. Flat rate pigs cannot be subjected to such close scrutiny, with the prevailing market price being paid for any animal up to 25 mm, and only after this can any penalty be imposed. St Edmunds currently procures 30% of its pigs from contracts with Eastern Counties Farmers, United Pig Breeders and Porcofram Limited, and a further 60% come from the eighteen Syndicate Members. The Syndicate has proved to be an enormous success, with regular meetings taking place between producers and the factory management, when any relevant points can be discussed. This is just another example of the benefit of the very close ralationship that exists between St Edmunds and its suppliers.